Electromechanical NC joining modules EMC are cost-effective and compact electromechanical press, pull and joining systems for demanding applications. 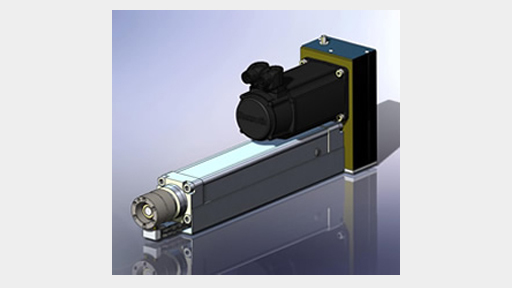 The press modules with a robust ball screw drive offer maximum forces of 1.5 to 12 kN in three sizes in the pressure and tension direction based on EMC series cylinders by Bosch Rexroth. Typical application areas are press-fitting processes in automated assembly, where high precision and precision are required with consistent quality assurance and documentation. For example, For example, in the automotive and automotive supply industry for the assembly of viscous couplings, air pumps, valves, airbags, wishbones, axles, gears etc. The maximum traversing speeds range from 260 mm/s to 360 mm/s, the standard stroke is 200 or 250 mm depending on the model. The press modules can be installed either standing or horizontal. The spindle force is measured with a piezoelectric force transducer integrated into the tool holder. The actual forces on the tool are thus determined without the friction of the spindle or the pressure tube distorting the measurement. This allows a force control with an accuracy of <1% of the nominal value and a high reproducibility of the process. The distance measurement is performed by integrated absolute encoder within the engine. Press paths can be monitored and controlled via a separate displacement sensor on the tool holder, which allows a repeatability of up to 0.005 mm. The NC control of the press module is already integrated in the power section, which allows for a more precise and faster process control as well as shorter cycle times compared to an external control. The integration is simplified, a separate PLC is superfluous and the wiring effort is reduced, which offers cost advantages. The programming and setup is carried out via a user-friendly user interface via a control panel, the PLC or a PC. A personal computer with standard software from EMG is required for joining in documented quality with monitoring by means of envelope curves. A new feature is the monitoring of up to 3 windows within the control system of the NC joining module. The controller has digital inputs and outputs as well as CANopen, ProfiBus and Ethernet interfaces for programming and communication with a higher-level controller.